The arrangements for a high quality Facebook Live online video transmission from the funeral mysteriously failed at the last minute, which meant transmitting the whole thing from a hand-held iPhone (and Clear Vision did manage to broadcast a lot of the ceremony on YouTube). For Candradasa and me, who had intended to present the event live to camera, the prospect of holding this iPhone up in the air for three or four hours wasn’t attractive. But then messages and hearts started flowing up the Facebook Live screen from some of the thousands of viewers joining in from all over the world: “Hello from Pune”, “Thank you from Taiwan”, “Joining you from China”, “Dawn is breaking in Seattle. Very magical to be a part of this with you all.” There were greetings from Singapore and Mongolia, and from 100 people watching together from a group of villages in India – just one of many such Indian audiences. I knew my own sangha were watching together in the Stockholm Buddhist Centre too, as in many other Triratna centres around the world. Realising just how many people were watching in so many countries, it was really no problem to hold up an iPhone for several hours. The Facebook Live footage does not include the burial itself and the YouTube footage includes the burial but lacks some other parts. Happily Clear Vision filmed everything and will produce a properly edited video programme about the day in due course. Those gathered here included four people from Bhante’s own family, a few of his non-Buddhist friends and about 15 Buddhists from other traditions. Many of them were deeply affected by taking part and commented on what a wonderful experience it had been, what an extraordinary feat of organisation the event represented, and how marvellously they had been taken care of. To finish, here is the English translation of the text of the song with which the funeral opened: ‘Sunset’ (Abendrot) one of the ‘Four Last Songs’ composed by Richard Strauss. forth – our souls’ disguises. of getting lost, we find beauty – No regrets. 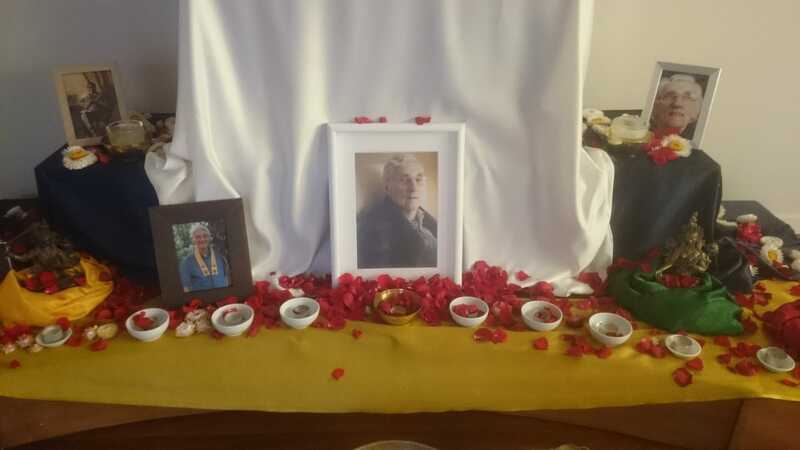 +Follow the dedicated Sangharakshita memorial space on The Buddhist Centre Online. Thank you Munisha for sharing that beautiful song with all of us, it touched me deeply ,and for your post about how the service went. I appreciate your efforts very much. Thank you Munisha for that moving post and for all the work you put in, your energy and dedication. So much love and gratitude also to all the very many people who combined to create the conditions for such a fitting tribute and leave-taking, and who looked after all the attendees so well. May we each serve the Dharma and Bhante’s vision. I also want to express my deep gratitude to the Adhisthana community, for all they have done over the past week and a half. What a testament to our great teacher. Thank you so much to all who were involved for all your efforts and hard work. My parents watched the whole thing live with you and were very touched by all that happened. Making it available to people has had more effect that you will probably ever know! I look forward to seeing the edited version. Yes to all the above responses to your generous post, Munisha, and Dhammarati’s great photos. Thank you! And deep deep thanks to the whole team that made it possible for us to be part of this momentous and beautiful occasion. I watched and participated live with Padmadharini and Elaine Smith at their home in New Jersey and now am back home in New Hampshire and still feeling the positive force of the sense of connection in shared gratitude and love. Moved to tears - yet again - by this post and responses. I felt so privilege to be present at this momentous and beautiful event and it’s wonderful to get a sense of how many people round the world were tuning in. Much gratitude to you Munisha for all the many ways you care for our sangha, and to you, Candradasa, Sanghadhara and friends for all your efforts to keep us all connected. Huge thanks to you Munisha, to all the communications team, to the Adhisthana teams and volunteers, to Dhammarati for the beautiful photos. It was an amazing event, very moving to be there and also to have these lovely records. Thank you all! Huge thanks and love to you all for making this truly ‘Mahāyāna’ event happen so beautifully and connectedly. May all blessings be yours 💛💙❤️ And wishing you a good rest now too! Thanks, everyone. I just couldn’t help posting that, even at the end of a long and emotional day. The day just seemed to need a response and I wanted to share with others my particular experience. Someone told me that Bhante’s family were rather surprised to discover just how many lives great uncle Dennis had touched - and one of them asked where he could learn to meditate. I was just volunteering with the communications team for Saturday. If you’d like to express your appreciation of their work that day, please consider supporting with a monthly or one-off donation the two charities who formed that team, who - year round - provide us with video, audio and pictures (new and archived), our mitra study materials, our key Facebook pages and many Triratna websites: Clear Vision and Dharmachakra. Their work would be so much easier if they were not always having to wonder how to pay for it. You could encourage your chapters, mitra study groups and Going for Refuge groups - and your sanghas more generally - to do the same. Thank you all at Clear Vision and The Buddhist Centre Online for making the ceremony available to all who wanted to tune in around the world. And what a wonderful day it was! Very moving to have been there with so many friends. I have really appreciated all the posts, podcasts and photos over the past fortnight, which have connected me deeper than ever with Bhante. Deep gratitude also from us in Sydney, Australia, where around 20 people gathered at midnight to watch the funeral in real time, to participate in the Puja and mantra chanting, and be ‘present’ at the event alongside thousands of others around the globe. We had another follow-up event the next day, attended by around 30 people, finishing with Bhante’s Threefold Puja and scattering of flower petals. Thank you to Munisha, to all at TBCO, Clear Vision, Adhisthana and all who supported this unique event. Extremely grateful to all of you for showing live telecast. We all at Nagaloka with hundreds of people could see on 15x10 LED screen and offer flowers at the same time when you all were offering petals. We feel, we are also participating as we were also chanting Shakyamuni Mantra in tune with you while doing offering to Bhante’s image. Vivekaratna.